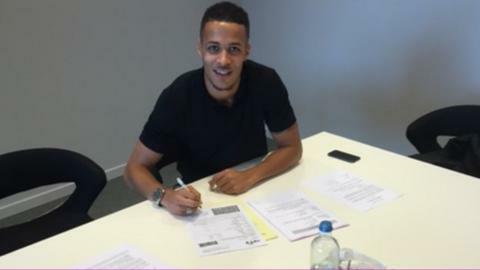 Nigeria international defender William Troost-Ekong has joined Belgian champions Gent. The 21-year-old, who was a youth player with Tottenham, moves from Dutch club FC Groningen and has agreed a three-year contract. However, he will spend the first year on loan at Norway's FK Haugesund. "I'm very happy to have signed with the Belgium champions. I took my time deciding on my next best step," Troost-Ekong told BBC Sport. "I thank Gent for this great opportunity and I look forward to joining the club at the end of my loan." The Super Eagle rejected a big-money offer from Russian club Rostov and he also turned down interest from Spanish second-tier club SD Ponferradina and an English Championship side. He added: "I spoke with the Nigeria coach [Sunday Oliseh] and the emphasis was for me to ensure that I am playing regular top-flight football even if that meant seeking a loan move. "I'm thankful for his advice and together with what I and my management had in mind, this was the best option. "Going to Norway gives me an opportunity to play regularly and continue my progress." Troost-Ekong, who made his debut for Nigeria in a match against Chad on 13 June, represented the Netherlands at youth level before switching allegiance to his father's country.